Olive green coat of silk or manmade silk. Most of it is of treated twill fabric which has a metallic finish. The collar, fronts and front facings and lower sleeves are of plain weave matte material. A band of petersham of dark blue and light blue stripes runs from shoulder to hem on right front side, turnover collar, deep cross-over fastening with two large metal buttons 4.9 cm diameter on left side seam and belt 7.7 cm wide with rectangular matte silver buckle. Set in pockets on side seams, false pocket that on left hip. The full length set in sleeves are in two parts - an upper section extending from shoulder of treated fabric with a lower sleeve of matte fabric gathered to it. Low deep set-in gores make the hem very wide (426.6 cm). It is stiffened so that it sits out in wide curves. 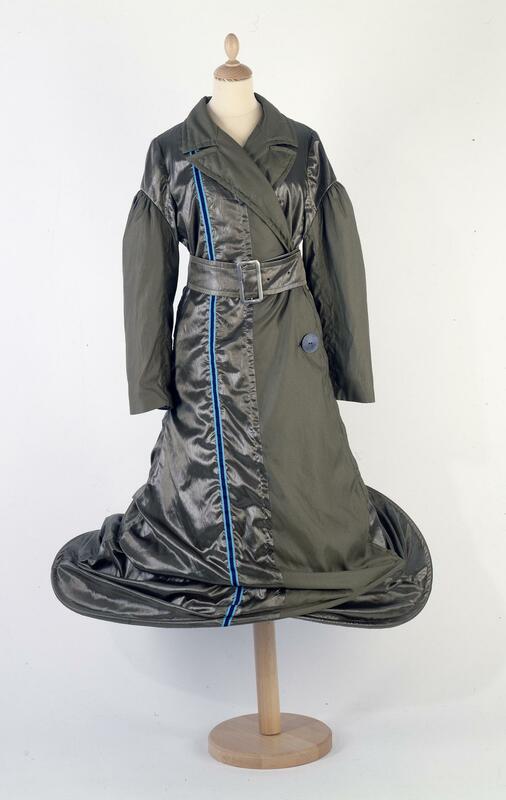 Coat is lined with grey plain weave silk or manmade silk. The outer fabric is cut more loosely than the lining so that it falls in folds towards hem. Label woven white on dark grey 'S. Wauchob' with button marked 44 sewn on label 4.5 xm 2.6 cm .